The ASICS Gel Lyte V receives a speckled treatment for the runners latest edition. 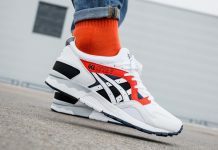 This ASICS Gel Lyte V “Grey Speckle” is part of a series of speckle releases (following the “Black Speckle” pair) that features shades of Grey throughout the upper, with Black detailing sitting atop a White speckled midsole towards the heel. Check out the detailed photos below and look for these available now overassess at Foot Locker EU. Stay tuned to Sneaker Bar for availability here in the states.